Big German V8s Becoming Extinct? Turbos to Blame? No, I don’t think they’ll be completely disappearing any time soon but they may become more difficult to find. And that may not necessarily be a bad thing. The trend towards smaller, more efficient gasoline engines has made its way to Germany’s big V8s. Audi, BMW, and Mercedes Benz have begun, or plan to begin downsizing their big displacement, high performance V8s in favor of smaller, turbocharged versions boasting better gas mileage. 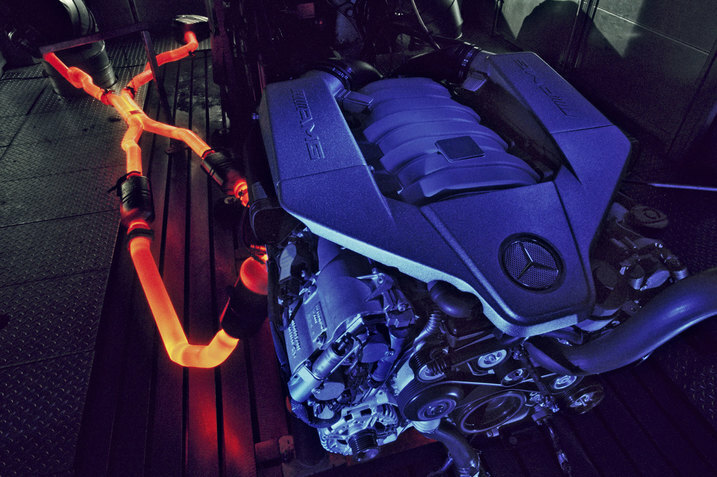 Mercedes Benz is expected to replace the 6.2L V8s found in the AMG line with a smaller, twin turbocharged V8. BMW will apparently introduce 7-series models equipped with an inline 6. Twin turbos will provide the extra boost here too. Many an Audi already house turbocharged engines. For 2010, the A4 has even lost the option for a naturally aspirated V6. It’s only the 2.0T from now on. I am propelled daily by a ’90s era Northstar V8 and I would hate to give it up or even downsize it. If better fuel economy, and a turbocharger or two were part of the deal, however, I might reconsider. Hopefully buyers of upcoming German luxury sedans will agree. This entry was posted on December 17, 2009 by Peter. It was filed under New Cars, News and was tagged with Audi, BMW, engines, Mercedes Benz. Welcome to Motorthusiast, a site dedicated to the world of cars. Check back regularly for news, photos, videos, opinions, and occasional reviews.